Including styrene and toluene, from synthetic rubber and vehicle fuels. WARNING: The products you are purchasing could be exposed to chemicals known to the State of California to cause cancer and birth defects or other reproductive harm. BroView S7 8000LM H4 9003 LED Headlight Conversion Kit 50W Cree 6500K Lamp Bulbs. Power: 50W. LED type:Osram 3030-SMD. BroView V Series V8 12000LM H7 Cree Headlight Dual Beam 72W White LED For BMW x2. Compatible partnumber : H8 H11 H9 (For Reference ONLY). Fog Driving Light (Not Bright Enough for Headlight Low Beam ). 2xAmber/White High Power LED Switchback 3157 Turn Signal Light No Error Resistor. Compatible List: H8;H9;H11;64212;64211 (For Reference ONLY). BroView S7 8000LM H4 9003 LED Headlight Conversion Kit 50W Cree 6500K Lamp Bulbs. LED Chip: Osram 10-3030 SMD chip. Fog Driving Light (Not Bright Enough for Headlight Low Beam ). Interchange Part Number: 9005,HB3,9005XS. Power: 60W. 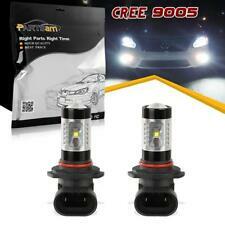 High Power Canbus Error Free T10 LED Bulbs For Backup Reverse Lights 2pcs. 7440 T20 7443 Red 60 LED Tail Lamp Brake/Stop Signal Light 60 LED 3528 SMD Bulb. Interchange Part Number: 9005,HB3,9005XS. Interchange part number: 9005, HB3, 9005XS. Those are NOT problems of LED bulb and NOT covered by warranty. You may simply add a set of load resistor (NOT included) to avoid those issues. Bulb Type: H3 Halogen. Light Type: Fog Beam. Light Color: Yellow. Housing Color: Black. Lens Material: Glass. Built with round, black stamped steel housing, the ultra thin design allows for easy installation and is designed specifically for small and mid-size trucks as well as SUVs. 06-12 Toyota Rav 4. 10-14 Toyota 4Runner. 08-11 Toyota Highlander. Fits07 08 09 10 11 12 13 14 Toyota Camry and Toyota corolla 09 10 11 12 13 14 15 FRONT BUMPER FOG LAMP / Fog lights (LH RH) ( LH RH ) Pair / Set W BULBS ( H11 12V 55W).